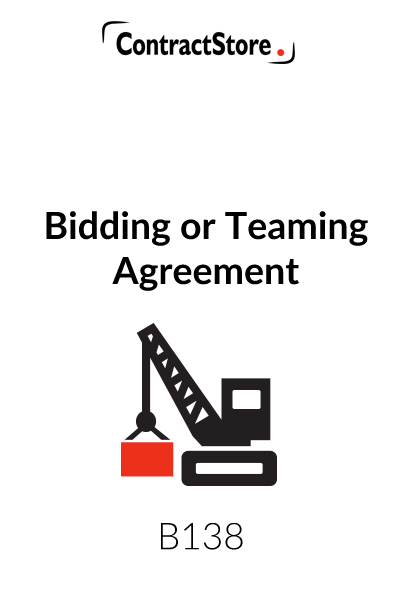 This Bidding Agreement (Teaming Agreement in the USA) sets out the basis upon which two parties will co-operate together to bid for a contract. Use this legal document template when you want your company to co-operate with another company in bidding for a contract, to clarify the terms of your relationship. This Bidding Agreement is designed to provide a framework for two companies that wish to co-operate together in a Tender for a project. Our draft assumes that one of those parties, Party A, will lead the Tender and sign the Project Contract if the Tender is successful. Party A will then enter into a subcontract with Party B for Party B’s portion of the project. In other circumstances, both parties might sign the Project Contract or they could create a special purpose company, which enters into the Project Contract with the client. This clause contains wording which requires the parties to co-operate “in good faith” – i.e. honestly and openly. 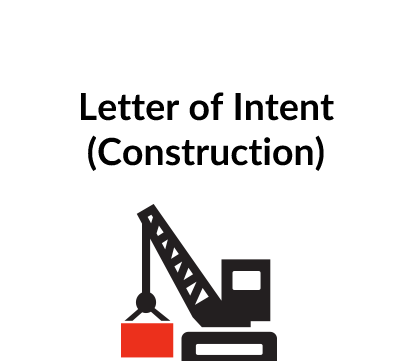 While the legal meaning is not precise, it does suggest the right spirit for co-operation on a project such as this. 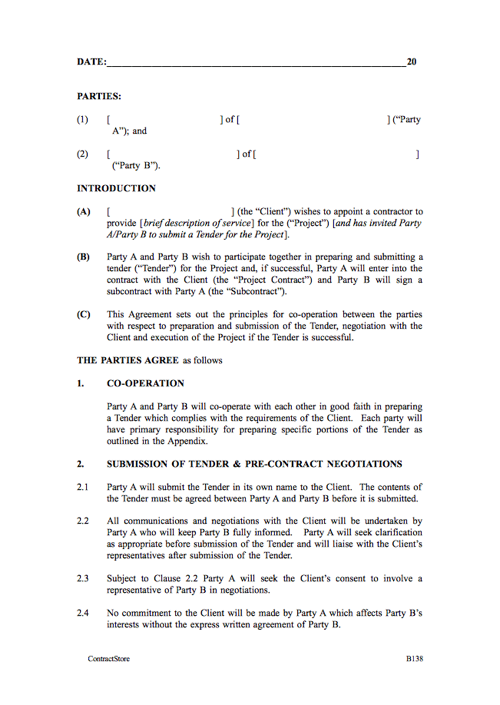 This clause deals in relative detail with the practical aspects of the Tender – Party A will submit the Tender. (As to who should make the submission, this will usually be determined in advance since one of the parties will probably be pre-qualified to bid and the Client will therefore expect to see that party’s name on the Tender). Party A will lead the negotiations but – and this is important – it will keep Party B fully informed of what is going on and will try to bring Party B into the negotiations directly with the Client. The clause requires both parties to sign off on the Tender and no change will be made without the consent of both of them. Clearly, this could present problems – if, for example, the Client wants to expand the scope of the project without increasing the price, one of the parties might be more willing to accommodate the Client than the other. Such a situation is not dealt with in this agreement and it may be that there should be a reference to an independent expert or provision for either party to withdraw or seek another party if that happens. It is usual, as stated here, for each party submitting a Tender to bear its own costs. We do, however, provide in sub-clause 2 for a situation where one party incurs costs which benefits both parties and in such a case, with prior agreement, those costs will be shared. Such a situation could arise, for example, if Party A commissions a technical consultant to help with the tender and the consultant’s work will benefit both A & B. 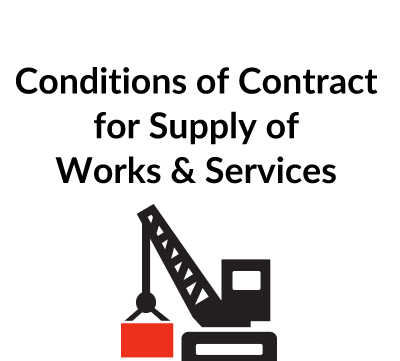 This clause contains a number of provisions which are designed to avoid future uncertainty as to the terms of the subcontract. Clearly, until the Tender is accepted and the terms of the Project Contract are known, it is not going to be possible to finalise any subcontract. However, the principles need to be agreed in advance and some of those are contained in this clause. A Bidding Agreement, which refers to a prospective subcontract, as here, would not necessarily be enforceable: under English law, it constitutes “an agreement to agree” which the courts might not be willing to enforce. Clearly, there is a risk that the parties fall out over the terms of the subcontract before it is finally signed but with goodwill on both sides, hopefully any differences can be sorted out and the subcontract terms agreed. 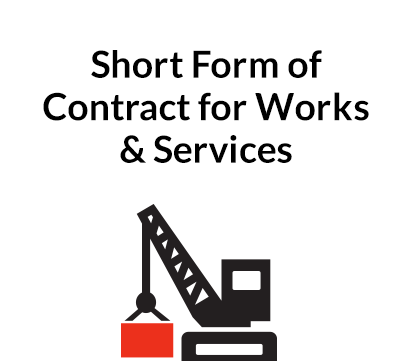 For reasons stated above in relation to subcontracts, a further agreement may be appropriate – when the Tender is submitted, a more detailed agreement could be entered into which crystallises the terms on which each party will co-operate. A further agreement might also contain the draft subcontract as an Appendix so that there is certainty at that stage as to the precise terms of the subcontract. This clause contains some general obligations – to use best efforts to procure the bid, to act in good faith and to act on an exclusive basis. Sub-clause 4 is designed to prevent either party from co-operating with anyone else while this Bidding Agreement is in place. Having stated the governing law in sub-clause 1, we refer to good faith negotiations between senior executives followed by arbitration if that proves to be unsuccessful. For other possibilities with respect to resolution of disputes see the free document on our website.